61 A wedding invitation arrives in the mail and you mentally sift through all the clothes in your closet. What the heck are you going to wear? 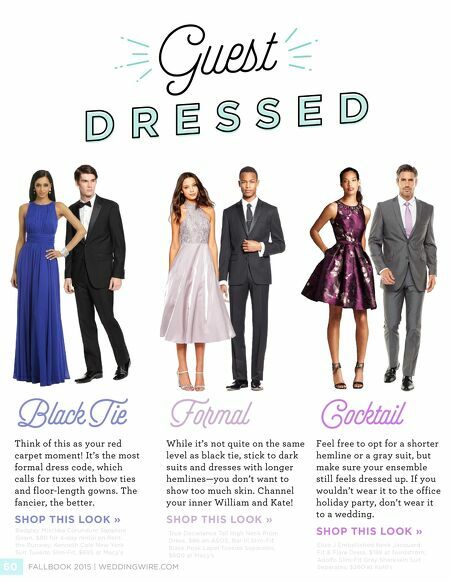 We've laid it out for you here plain and simple—from the fanciest of fêtes to a casual celebration, you'll know exactly how to dress. BY Sarah Title It's your chance to get a little more creative with brighter hues. A flowy and flirty dress or a casual suit would be just the ticket. 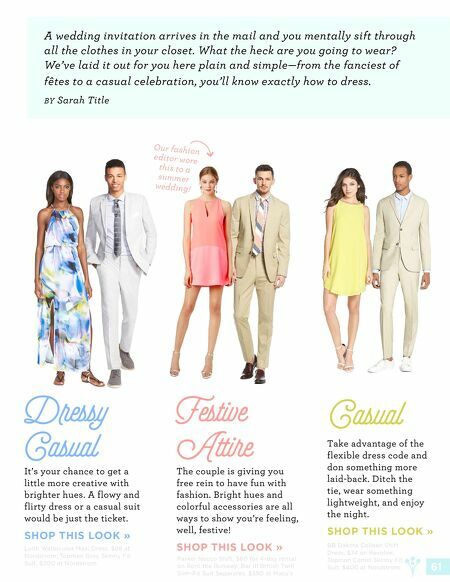 SHOP THIS LOOK » The couple is giving you free rein to have fun with fashion. Bright hues and colorful accessories are all ways to show you're feeling, well, festive! SHOP THIS LOOK » Take advantage of the flexible dress code and don something more laid-back. Ditch the tie, wear something lightweight, and enjoy the night. SHOP THIS LOOK » Dressy Casual Festive Attire Casual Leith Watercolor Maxi Dress, $88 at Nordstrom; Topman Grey Skinny Fit Suit, $200 at Nordstrom Parker Necco Shift, $60 for 4-day rental on Rent the Runway; Bar III British Twill Slim-Fit Suit Separates, $550 at Macy's BB Dakota Colleen Shift Dress, $74 on Revolve; Topman Camel Skinny Fit Suit, $400 at Nordstrom Our fashion editor wore this to a summer wedding!